Rethinking the way we think. starting with planet Earth, home for all. with Triple Bottom Line thinking. but also social and environmental impacts. 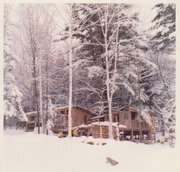 A US citizen, I credit my unusual life perspective, first and foremost, to my "back-to-the-land" upbringing in the Adirondack mountains - where "us kids" helped in every aspect of homestead life, from peeling logs to milking goats. We used kerosene lamps and did not have an indoor toilet, although we did (over time) evolve to cold AND HOT running water thanks to the ingenuity of my Pa...who, together with Ma, still lives in a (different) self-built log cabin, where he continues to tinker, add additions, and invent amazing solutions for a variety of challenges that require a Da Vinci-like breadth and depth of knowledge, not to mention the firm support of my soy-milk making, bread-baking mom, who takes care of important things like time and is a wonderful teacher. ...in 1996, I moved to Germany. There, I began a career that has involved in bringing emerging technologies into the European market through channel and direct sales models, with a focus on the capture/input and storage/data lifecycle management, and h unavoidable heavy exposure to the associated processes and systems implicated in this framework, e.g. ECM, ERP, BPM, BI and "high-end" kit (as the Brits like to say) like SANs and triple digit price tag BIG scanners. The most fun I've had in my worklife was when I was able to focus on business processes and deeply understanding the solution ecosystem from the perspective of all stakeholders. Finding the win-win in a complementary vendor relationship or working together with a prospective customer to jointly validate solution value...situations where everyone comes out a winner. The least fun for me is dealing with boring repetitive tasks, like a manual respacing job just made necessary by a cut and paste from one text box here in Weebly to another. Shameful! education modules, and was trained in various solution selling approaches including the Bosworth solution selling methodology, (with all 4 Bosworth brothers!). In June 2010, I earned a certificate in Sustainable Business through a highly-recommended online program offered by the University of Southern Maine. A technology-focused futurist, I believe in practical solutions for a sustainable planet: it will take time to shift business culture from "Good to Great" to the fusion of ideas we see emerging from such disparate sources as Deloitte's Center for the Edge, the Renaiassance2 Foundation and Davos (watch this pre-event press conference - notable quotes: "we are in the midst of a great transformation" and "the old model is capitalism, the new model will be talentism", as well as "we are desperately seeking solutions", in a time when the Tipping Point's been scientifically verified to be 10% by RPI researchers. Some heavy tweaking that put human well being and motivation at the heart of the matter and much goodwill and innovating thinking is there for the harnessing! A big believer in dialectic principles of discourse and change, I welcome provocative dialogue and learning through conversations. Here is my current reading list.